Leah Pritchett is ready to once again burn rubber and make some noise in Pomona this weekend. She’s coming off of a season that had some highs and lows, as one can expected in the hyper-competitive world of drag racing. 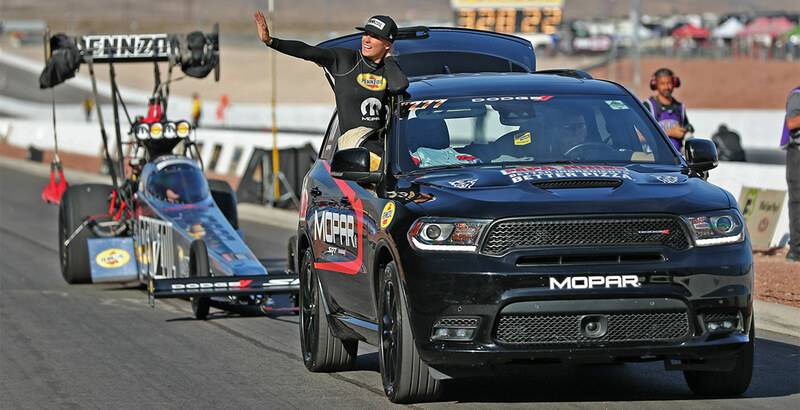 Despite snagging the 2018 NHRA Factory Stock Showdown World Championship in her Dodge Challenger Mopar® Drag Pak, Leah was also chasing a championship in her Dodge/Mopar DSR Top Fuel Dragster. With two wins and three runner-up finishes, she ended up fourth in points last year. Most drivers would be happy to finish in the top-half of the field, but for Leah, she’s always looking to improve the performance of herself and the crew. They learned a lot of lessons last year and the team is excited and ready to go. They’ve packed up their HEMI® engine-powered 334-mph missile – which covers 1,000 feet in 3.6 seconds – and are heading to the season-opening NHRA Winternationals. During the off-season, there was no rest for Leah as she’s always striving to improve both her mental and physical abilities. Like many other professional drivers, Leah used the off-season to hone her skills in preparation for another grueling NHRA season. In 2019, Leah and her team will once again hit drag strips across the country chasing an NHRA Top Fuel World Championship title. She and her team know that every time they roll into the pits, it’s going to be an intense battle with every one of the competitors chasing the same goal. However, what motivates the 30-year-old driver is her determination to be the best and claim an NHRA World Championship for her sponsors. “Our goal for the 2019 season is to surpass every mile-marker that we did in 2018. That means multiple race wins and, of course, a world championship! That is the ultimate goal of the team this year and it’s not a far-fetched one,” exclaimed Leah. Like most drivers we’ve spoken to, the historic NHRA Winternationals holds a special place in their hearts and minds. Everyone wants to win the season-opening race as it sets the tone for the rest of the year. For Leah Pritchett, she has many fond memories but one really stands out. With any luck, Leah and her crew will experience déjà vu and once again park her DSR Dodge/Mopar Top Fuel Dragster in the NHRA Winternationals winner’s circle.